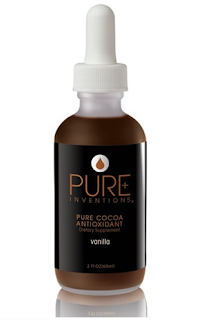 Pure Inventions Pure Cocoa Antioxidant Extracts contain the highest amounts of chocolate antioxidants, including the flavonols (these are the cocoa's antioxidants) and polyphynols associated with lower blood pressure and optimal cardiovascular health. These studies show that these flavonols seem to prevent both cell damage and inflammation! Recent studies show that cocoa may help promote healthy skin structure and density. Studies have also shown that cocoa may support, protect and increase blood flow to the skin - improving its appearance. Sweetened naturally with Lo Han fruit (known as the Longevity Fruit and excellent for digestion), they are sugar-free, artificial sweetener-free, caffeine-free and calorie-free. It's amazing that something so delicious can be this good for you too! It is believed that the ancient Mayans and Aztecs first enjoyed chocolate as a sacred drink, usually reserved for royalty. Two thousand years later, we've come full circle and can experience it once again in a pure beverage form. Pure Cocoa Antioxidant Extracts are available in 3 delicious flavors: Vanilla, Mint, and Cocoa and are for purchase at our spa.